Add this box and then four one-half pound coffees to your shopping cart. Or, if you are in a hurry, choose one of the three preselected gift options below and we will select the coffee for you. Coffee is not included in the price; please be sure you add four half pound boxes of coffee to your cart or let us choose for you by selecting one of the assortment options below. 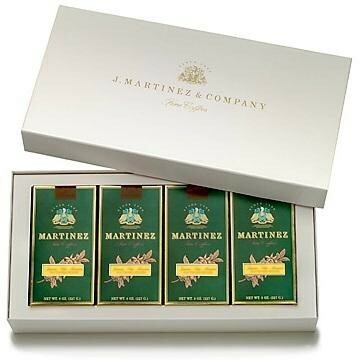 The J. Martinez & Company presentation gift selection is an elegant and generous alternative to the standard gift basket. Add this attractive gift box to your shopping cart and four half pound coffees from our extensive selection of coffees or let us select for you by choosing one of the options above. The coffee can be any selection of four half pound boxes from any category of the "Coffees" menu. Coffee is not included in the price; please be sure you add four half pound boxes of coffee to your cart or let us choose by selecting one of the assortment options above.